Look Ma, still no congressional national security oversight! We can still buy whatever we want from their own foreign aid grants to us! Newsweek reporter Jeff Stein's "double-tap" exposé of Israeli espionage in the United States has put Israel and its American lobby on red alert. 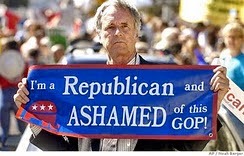 Stein's initial salvo "Israel Won't Stop Spying on the U.S." generated howls of outrage over veteran CIA analyst Paul Pillar's accurate assessment that Zionists had been sending spies to appropriate U.S. resources and weapons even before the state was founded. Pressed for details, Stein's second piece "Israel's Aggressive Spying in the US Mostly Hushed Up" exposed a bumbling Israeli spy's unsuccessful attempt to enter Al Gore's hotel room through an air duct. According to Stein, the dwindling number of U.S. criminal prosecutions is because the FBI has been directed by the Justice Department to privately chastise, but not expose, Israel's spy networks. The most recent criminal espionage prosecution, that of former NASA official Stewart Nozette, carefully sealed off his handlers at Israel Aerospace Industries from any consequences. 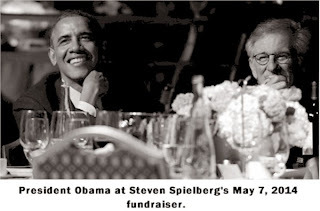 Nozette had received $225,000 and admitted to passing secrets to Israel, but rather than go after his paymasters, the FBI set up an elaborate sting operation. According to Stein, other American counterintelligence officials felt instant push-back whenever they tried to warn U.S. elected officials about Israeli espionage. The new spying allegations come at an inconvenient time since Israel and its U.S. lobby have been ramping up efforts to obtain visa-free Israeli entry to the United States. Israel's poor record of visa overstays, thousands of young people entering under tourist visas to work in the U.S. and the growing espionage flap appear to make Israel unlikely to enter the visa waiver program any time soon. But three strategies have proven extremely successful in the past for dampening fallout. Flood American influencers with cash, send in Israeli government officials to quietly lobby key policymakers and charge opponents with anti-Semitism. In the early days of weapons smuggling, Israel's spies relied on the ageless tactic of "spreading money around" to keep criminal cases out of court whenever spies were caught. In 1947, American members of the vast Jewish Agency/Haganah smuggling ring "assembled a war chest" of funds to keep "70 potential indictments in Los Angeles" over weapons smuggling to Jewish fighters in Palestine from going to court. Assembling and carefully disbursing such funds in coordination with the Israeli government worked well in those days and appears to be working just as well today, though the conduits have changed. The Los Angeles Police Department Foundation's decision to host a fundraising gala (PDF) on May 10, 2014 to honor—of all people—Israeli movie producer Arnon Milchan—is the latest version of the strategy. 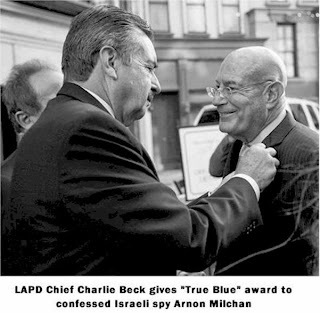 In 2012 the FBI released compelling files of Milchan's involvement smuggling nuclear weapons technology from the United States in league with Benjamin Netanyahu and California engineer Richard Kelly Smyth. Milchan confessed to much of his criminal past as a smuggler during an Israeli television interview on November 25, 2013. This confession and declassified documents formed the basis of a public complaint (PDF) to U.S. agency heads calling for his deportation over flouting the Foreign Agents Registration Act and for visa fraud. By engineering a fundraiser and LAPD award in his honor, the Los Angeles Police Department Foundation appears to be trying to buy the public appearance that all is well. After all, if the metropolitan police department approves of Milchan, doesn't that prove he's an upstanding member of the community? Perhaps not. The organization behind the award, the Los Angeles Police Department Foundation core leadership Cecilia and Jeffrey Glassman are longtime Israel advocates. LAPDF has sent police department personnel to Israel (PDF) for training in addition to building up the endowment of cash it provides to the police department for high tech gadgets taxpayers won't fund. These efforts to protect Milchan and change the subject are more refined than in the 1940's.